Spyro: Season of Ice falls just short of four stars based on repetitive gameplay and the unimaginative plot (or lack there of). 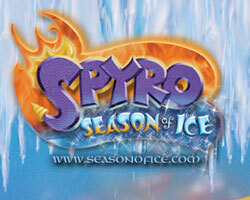 Spyro has to unfreeze fairies that this strange two-headed rhino sealed in ice. Apparently, this has something to do with the last game, but I wouldnt know seeing as I havent played any of the previous Spyro games. You acquire the fairies by completing challenges or just by finding them while out and about. You use them to open new levels and eventually new worlds, which are named after the times of year (i.e. you start in fall, get it? Season of Ice). Each fairy has a name and they all happen to be female (I smell a sexual discrimination lawsuit). Surprisingly, the names arent that original ranging from Alexandra to Zoe. How you obtain the fairies is fairly simple; each level has a theme (e.g. the beach, cave-men, the forest, etc.) and some challenges will be theme specific and some will be extremely generic but slightly twisted to fit the theme. For example, on the beach level you have to kill all the rhinos just like you have to everywhere else, but now theyre wearing bathing suits or even pirate hats. Similarly, you have to burn down all the sand castles on the beach, but start all the campfires in the forest. Sometimes the friendly natives will ask Spyro for help; the merman wants you to light all the lighthouses so he can find his date, and the caveman who speaks proper English wants you to stop the pterodactyls from ruining the cactus patches. Conveniently all of them give you a frozen fairy as a token of gratitude. The game motif is nice for a while, but then it just manages to get on your nerves. All levels have the same basic set-up, just rearranged a bit and with different textures (the beach has sand and wet sand, the cave-men have lava and bones, the forest has grass and leaves, you get the picture). Even the bad guys are just a running theme. They use the same kinds of attacks only with theme related spins (the cave man-rhino throws rocks, while the more sophisticated forest-rhino uses a mortar). Maybe if you were a Spyro fan the plot would seem better and make a whole lot more sense. If you find solace in repetition and habit, if you frighten easily or are prone to heart attacks, then this game is for you. But, if you have any short-term memory at all, then youll always know whats going to be around the corner. Sure, its kind of fun to see what variation theyve come up with to suit each level, but thats not enough to keep someones attention for long. Ups: Nice graphics; popular with the younger Spyro fans; good controls.